Jason and Jennifer Alderman became unexpected small business owners when they saw potential in a homebrewing supply store that was on the brink of closure. Editor’s note: This month, we’re sharing the stories of small businesses that have successfully navigated the startup process, and taking a look at what challenges they faced during year one and beyond. We wanted to know: What growing pains do business owners face once they have opened their doors? What are their struggles and successes? Check back in next week—we’ll be telling the unique story of another small business. You can find last week’s article here. That’s not what you’d expect to hear from someone who has taken over ownership of an existing business, but that was the case for Jason Alderman. Outdated ordering systems, unpopular inventory, and unhappy rumblings from customers contributed to the decline of a once-healthy business—yet Jason and his wife Jennifer believed the business still had potential. In 2014, the Aldermans bought Home Fermenter Center (which they’ve since rebranded as Home Fermenter) in Eugene, Oregon. 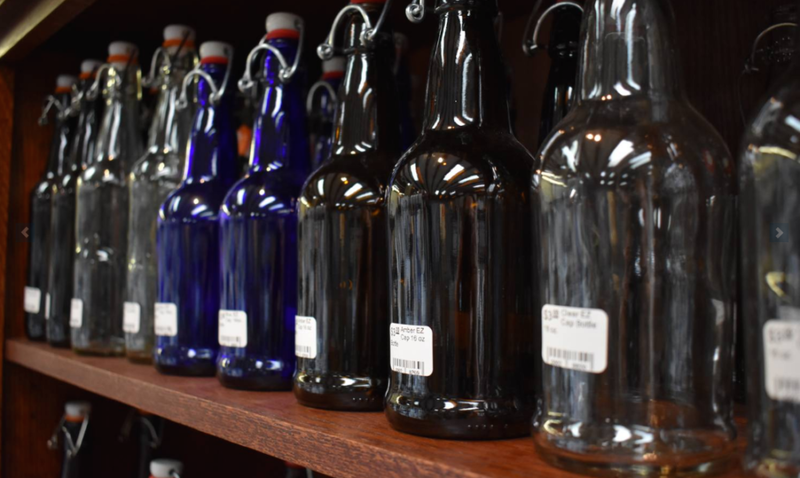 The Aldermans loved the shop so much that instead of going to closer shops or ordering online, they drove an hour south from their home in Albany to get their supplies for homebrewing beer and making fermented foods. In January 2014, the owners pulled them aside. They were ready to retire and wanted to sell the shop. Prohibition made homebrewing—the making of beer or wine at home—illegal nationwide in 1919. Even though Prohibition was repealed in 1933, homebrewing was only federally legalized in 1978. Founded in 1979, Home Fermenter was among the first shops in the country to supply the equipment and ingredients to make, store, and serve beer or wine at home. Over the years, it also became a hub for people wanting to make cheese, soda, kombucha, kefir, yogurt, and other fermented foods and beverages. On the drive down to Eugene that day in January when the owners expressed their interest in selling the business, Jennifer mentioned that the shop’s owners were at retirement age, and wouldn’t it be interesting if they said they wanted to sell the store? After that conversation with the owners, the Aldermans left the store with an opportunity—and a massive lifestyle change—on the table. They started examining numbers, planning, and discussing, both for the shop and for their personal lives. Alderman also turned to his network of friends and colleagues, seeking advice, showing them plans, and asking what was missing. They would relocate to Eugene (where Jennifer currently still works full-time at another job), and Jason would leave his high-paying job. Between inventory problems, system updates, remodeling the store, and repairing the brand’s reputation, it wasn’t going to be easy. But the Aldermans were planning for that. After three months of soul-searching, planning, number-crunching, and advice-seeking, on April 7, 2014, they officially took over Home Fermenter. Vague and incomplete organization made it hard to decipher the shop’s accounting and inventory records. Once Alderman put together as complete a picture as he could, it turned out that inventory was off tens of thousands of dollars, prices were too high, and a good deal of inventory needed to be liquidated and replaced with more in-demand products. “I knew a challenge would be that the shop never updated to the digital age,” says Alderman. There was an old, analog cash register, and the previous owners used print catalogs and fax forms to place orders with distributors. Alderman knew he would need to upgrade to digital ordering and implementing inventory and point-of-sale systems. But the problems with inventory and accounting meant big problems for the Aldermans. They would have to make significant changes their budget and financial outlook. The Aldermans pivoted as best they could. They decreased their budget for their wages and invested in inventory. They also paused plans to hire staff (though Alderman says the shop is on track for adding employees later in 2017). Refreshing inventory required broader, more strategic ordering. Remodeling entailed improving lighting in the dim shop, painting, adding a new exterior sign (with updated logo and name), and replacing the store’s display shelves, many of which had been in use since Home Fermenter opened in 1979. Winemaking had been the shop’s main business, but the Aldermans bumped up ingredients and supplies for beer making. Jennifer led the way on diversifying fermented foods supplies. She also experimented more with different ingredients and techniques, so she could share fermentation experiences with customers. Over the last three years, the Aldermans have tripled inventory to over 3,200 items available—and they’re happy to take special orders. The strategy is paying off. “After the first year we had turned a corner with how the community perceived the shop,” says Alderman. Closed only on Sundays, Home Fermenter was even open on holidays. One Fourth of July, a customer came in needing an emergency keg repair. Instead of the $100 fix he was expecting, Alderman fixed it for $13. Though many big improvements are complete, changes, additions, and upgrades continue. The Aldermans continue adding jars and other supplies for fermented foods. They’ve added more parts and draft systems for pouring beer, and have diversified winemaking equipment based on customer requests. Updating inventory has also opened up new challenges that the Aldermans are figuring out how to handle. Previously used only at the commercial level, stainless steel brewing equipment, especially conical tanks, have become more popular in the homebrewing world. “I brought some in as a showpiece, to show I could get them,” says Alderman. “Then I wound up selling more than I expected.” Now Alderman is making sure he has regular access to more stainless steel gear, along with the associated replacement parts and fittings needed to maintain a brewing system long-term. During the first year of ownership, the Aldermans had hoped to revamp and relaunch Home Fermenter’s basic website—complete with a brand-new online store and updated software systems. While integrating ecommerce has taken longer than expected, Home Fermenter’s online store will be launching soon. Alderman likes to learn on his feet—literally—and he is always striving to improve his knowledge of the business, the industry, and what Home Fermenter customers want. To keep up with inventory, customer needs, and how the online store will handle fulfillment, Alderman comes back to a simple philosophy of “shoe leather management.” He walks the shop himself and examines displays; if a product is literally gathering dust, it’s time to clear it out. Go above and beyond on service, and people will spread the word about you. When people have questions, listen and don’t assume you know their problem. Ask probing questions. Seek to understand the obstacles they’re facing from their perspective. Planning and running a store is complicated. Prioritize as best you can on what is most critical each day. Break down larger or long-term projects into smaller categories and individual tasks. Showcase eye-catching products that will excite customers and keep them coming back. Keep popular and heavier items at the “golden level” between waist and chest height, so they are more visible and are accessible with minimal strain or effort. Get rid of products that don’t move. Free up the capital and try again. Plan, partner, budget, and educate. Have a solid plan. Find good partners and advisors. Make a solid budget. Educate the heck out of yourself. The Aldermans have transformed Home Fermenter into a great community resource. Customers often comment on changes in the shop, or stop and look at the shiny stainless steel brewing gear or a home kombucha kit as soon as they enter the store. After meeting initial challenges, the Aldermans look forward to the online store increasing the shop’s national recognition, while still maintaining a mom-and-pop, community-friendly feel at home. “I’m glad I did this change. I’m doing more of what I should be doing as a career, and I’ve learned a whole lot,” says Alderman. The early years have had their challenges, but through planning, service, and perseverance, Home Fermenter is becoming the store the Aldermans knew it could be when these former customers made it their own.